Despite being released on a label that leans more towards pop than punk, Fueled By Ramen's latest signing, The Swellers manage to stand out with ' Ups And Downsizing'. A 40 minute jam-packed pop-punk fest, that successfully blends a rough undertone with neat presentation. From opening track, '2009', it delivers with bucket loads of energy and plenty of hooks. Whilst 'Fire Away' is perfectly structured and will have you singing along in no time. Elsewhere tracks like 'Sleeper' and 'Welcome Back Riders', keep up the momentum with strong melodies, that you will want to play over and over again. I'll admit for some, a non-stop pop-punk record may not be for everyone, as it may sound repetitive. However I would definitely suggest re-thinking this logic, as every track on this record, has its own characteristic. Whether it'd be the crashing drums on 'Feet First', or the party-like atmosphere given off on 'Do You Feel Better?' or fast and furious pace of 'The Iron'. Even though this might seem so obvious at first. The album reaches its peak at its conclusion, 'Stars' sees the band taking a breather with an acoustic number, that remarkably showcases the bands songwriting talent brilliantly. The track grabs your attention, both musically and lyrically, with Nick Diener's tale of heartache, that superbly builds to a full band performance, with his voice crying out "This one's for you". Whilst closing track, 'Dirt' rounds off the record perfectly. It's fast beat and personal lyrics; a message from Diener to friends and family, makes a great combination. Add to this an all-round performance, that is consistent throughout, and you are left with a near-perfect record. Somehow this Michigan-based four-piece have created a record that reminds the listener of bands like Alkaline Trio, Bouncing Souls and No Use For A Name, but at the same time form their own identity. This is mainly due to the record's lyrical content, as well as thriving energy of the band. 'Ups And Downsizing' is very much a worthy contender for pop-punk album of the year. Whilst others concentrate on breakdowns or how they look or how many plays they have on myspace, The Swellers are being themselves and have crafted a record, that is personal, authentic and musically superb. Although I will warn you that it is a record that gets better and more infectious on every listen. I guarantee you, if you like pop-punk, you will love this. 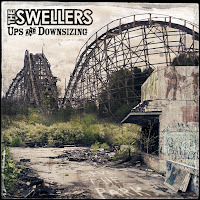 'Ups And Downsizing' by The Swellers is released on 29th September on Fueled By Ramen.